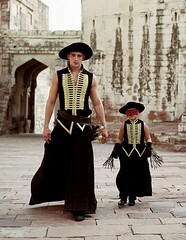 Bandits! Smart Monkey! Oh My! 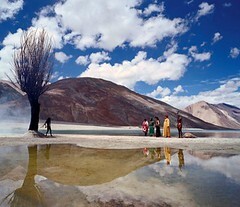 Reason #1: Sure, Tarsem (he has recently dropped his surname, Singh, for his filmmaking credits) was the director of the icky and poorly cast The Cell, but he does have a way with fantastical visual imagery. From the first shot to the last, The Fall captures you with such epic, poetic, vibrant images that perfectly brings to life a story that is running through the mind of a young child. I must admit, I was quite skeptical about seeing this film. After all, the reviewers were already calling it a “vanity piece”, “ostentatious”, and “flat”. 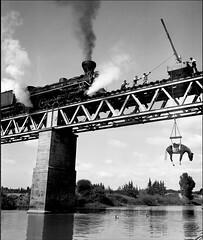 But with the opening sequence (a black and white hauntingly beautiful shot involving a train bridge, an old steam locomotive, a Native American, and a horse hanging from a rope) I was sucked in. More images abound, such as a man stepping out of a burning tree, arrows piercing a man’s back and weighing him down so that when he leans back, he is lying on a bed of arrows… vast deserts where the sand is a blazing orange and the sky is a saturated sapphire blue, and a lonely hospital just outside of Los Angeles in 1915 that is full of shadows and green paint. These images are quite lush, akin to Terry Gilliam’s The Adventures of Baron Munchausen and Yimou Zhang’s Hero, and show Tarsem’s love for perfectly framed imagery. In other words, it’s a beautiful film. Reason #2: When I was a little girl, one of my favorite things was hanging out with my dad and listening to the endless stories that he would tell. He had a way of taking something and making it sound so real and the images of his characters would stay with me for days. Since then, I’ve been a fan of children stories told by adults and seen through the eyes of a child. The Fall is just that. It’s a story within a story, told by Roy (Lee Pace) and imagined by Alexandria (Cantica Untaru). Roy is a paralyzed silent film stuntman with a broken back and a broken heart after his girlfriend left him for another man. Alexandria is a little girl with a broken arm who likes to wander the hospital. On one of her wanders, she meets Roy, who immediately befriends her. From there, he begins to tell her an epic story of bandits, heroes, villains, Darwin’s smart monkey, and a true love. He’s telling the story but it’s Alexandria who is giving us the images through her vivid imagination. Just as true hope can be found in Jesus when everything and everyone else around us has let us down and proven fleeting in this life, Roy finds hope in this story through the faith of a small child. “But those who hope in the Lord will renew their strength, they will soar on wings like eagles, they will walk and not be weary” (Isaiah 40: 31). Just saying. If you’re looking for a story of hope, check this out. There you have it. My reasons why you should at least give this film a try, despite the wealth of criticism: while it CAN be a bit flat in a couple of places and it’s not about high action drama, it’s an easy, gorgeous and sweet film that I think you just might like. Or love. Oh, and the bandits and the smart monkey are pretty cool, too. Clearly, this would have to be a large name tag.